Today we will take a look at the WWI German battleships. Germany did also develop a variety of battlecruisers, but to keep this post in a reasonable length they will be covered in a different post. Germany’s first Dreadnoughts. 146m long, 26,9m beam, 21000 tons displacement and 20 knots top speed. Although they are 15m shorter than the Dreadnought class they have the same displacement due to more armor. The belt was 80-300mm, the deck 55-80mm thick. A 30 mm torpedo bulkhead was the underwater protection. The conning tower was shielded by 400mm armor at the sides and 80 at the roof. The main battery consisted of 12 280mm (11 inch) guns in dual turrets with the same hexagonal layout as the Kawachi (but the one on the Kawachi was inspired by the Nassau class). 12x150mm (5.9 inch) and 16x88mm (3.5 inch) were mounted in casemates at the sides. During their careers the 88mm guns were removed and 2 two AA guns of the same calibre were installed. Additionally the ships were not very stable and many measures were taken to improve it with little success. Despite the tendency to roll she was considered maneuverable. An notable tale is a encounter with the British destroyer HMS Spitfire(1912) during the Battle of Jutland. In the confusion of the battle Nassau rammed Spitfire and tried to take her out with her A turret but could not depress the gun enough to score a hit. Nevertheless the gun blast destroyed Spitfire’s bridge but she managed to break free and rip a 30 foot (7m) hole in the Nassau’s side armor. Both ships survived the battle damaged and limped home with reduced speed. A slow ship, but you have to start somewhere. Expect it to have more survivability than other battleships but less firepower. In fact this can be said about most German Capital ships. You are there to take a beating for your team and your guns, while lacking damage are still deadly to most ships. You may need longer to destroy other ships, but you can afford to stay in contact longer. Your preferred playstyle should be getting in close so your strong belt can soak up the damage. An improved Nassau-class. Bigger, better, (a little) faster. The ships featured nearly the same armor layout, with improvements to casemate armor and the conn tower roof. The length was increased to 167m and the main battery calibre to 305mm (12 inch). 2 150mm guns were added at the cost of 2 88mm guns. AA was later added in the form of 2 88mm guns. Speed was improved to 21,2 knots. Handling was considered better, too. There was a debate about the turret layout but it was deemed that the hexagonal layout was safer because a superfiring pair could easier be disabled with one hit. You get the same ship just bigger and better armed. Still a slow tank. Still smaller caliber than other ships on your tier. Still relatively maneuverable. You get better used to it because that won’t change so soon. 172 long, 29m beam and with 27000 tons displacement the Kaiser-class was the next step in German Capital ship design. Protection was increased to 180-350 mm at the belt and 60-100 mm at the armored deck. The gun layout was changed to 305 mm (12 inch) guns in 5 dual turrets. One was located at the front, two en echelon amidships and a superfiring pair aft. An improved turret design was installed which allowed 4,1 km more range (to 20,4 km). 14 medium calibre (150mm) and 8 small calibre (88mm) guns were installed in casemates. 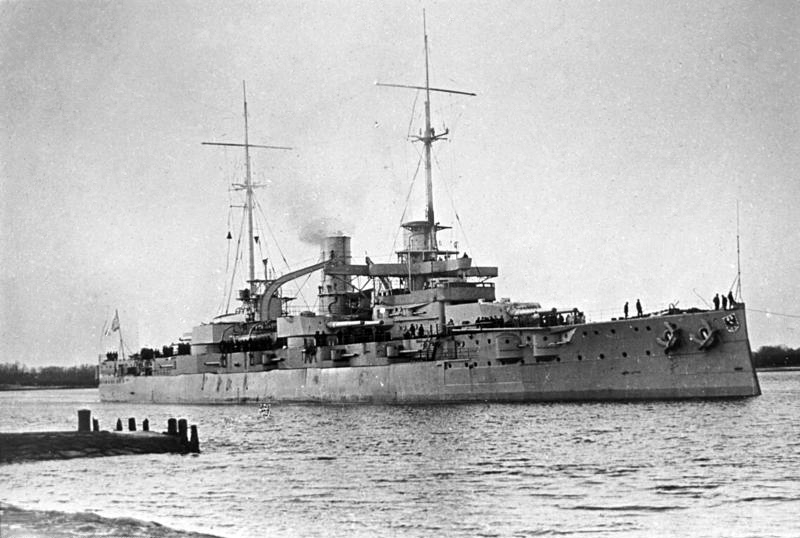 Kaiser was the first German capital ship to be propulsed by turbines but she could only sail at 23,4 knots. AA consisted of up to four 88mm Flak guns. You get an upgrade in every aspect. Your broadside punch stays the same but you can deliver it at longer range. You get more armor and speed. However, your gun calibre is now (expect Kaiser around T5) significantly lower than that of your counterparts. This can however be compensated with accuracy and rate of fire. And WG needs to invent some serious AA upgrade. The historical AA should give you a DPS of around 10, which is severely lacking for a T5 battleship at T5. See below for additional insight. A similar design to the Kaiser-class. The turret layout was changed again to 2-1-2 (like a Fuso without the third turret). Otherwise pretty similar to the Kaiser. 175m long, 30m beam and 28600 tons displacement. The Germans considered them to be “very good sea-boats”. 2 additional 88mm guns were fitted as well. A slightly bigger Kaiser with increased broadside punch. The AA is still massively lacking. I find it difficult to fit her in the game. We already have a T5, but at the same time she is too weak to be T6. Compared to the other T6 BBs she is outgunned, out speeded and has neglectable AA. You could make her another option at T5 but she is superior to the Kaiser-class in almost every aspect. The best solution would be to make the Kaiser-class class a premium and to put the König in the tree at T5. Another step in the same direction the Bayern-Class was a further improvement. Increasing the main battery calibre to 380mm (15 inch) 8 guns in 4 turrets were fitted, two at the bow and two at the stern. 16x150mm guns in casemates give you a strong short range armament. The armored belt was thickened to 170-350 mm, the deck armor remained at 60-100 mm. The ships were capable of up to 22,5 knots with an engine. The reload was quite fast (23 seconds) but according to British post war trials the accuracy was lacking. Still a slow and well protected ship. The armament gets beefed up massively to competitive 15 inch. Makes it a solid T6. Good alpha and penetration but only a limited amount of guns. Something must be done with the AA, maybe do a Fuso and put 20mm and 37mm Flak guns everywhere where you can fit one. They won’t have much range but better than nothing and a logical design step compared to other navies as well as to German WWII AA upgrades. A big step forward in German Capital ship design. Developed with the experience from the Battle of Jutland the project was supposed to be 238m long, have 33,5m beam and displace 48500 tons. 4x2x420mm (16,5 inch) was the planned primary battery while 12x150mm in casemats were the projected secondaries. AAA was planned to be either 8×88 mm or 8×105 mm guns. 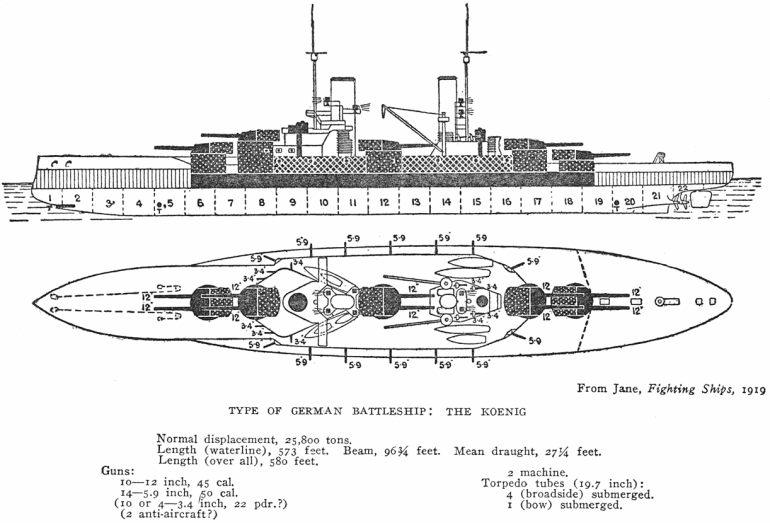 The difference between the L20 and the L24 was the placement of torpedo tubes. L20 carried submerged tubes while L24 was planned with deck mounted launchers. Armor plating below the waterline was cancelled in favor of additional speed, theoretically allowing the ships to travel with 26 knots. The armored deck which was 50-120mm thick was additionally protected by a 20-40mm forecastle deck. The belt thickness was not changed and therefore up to 350mm. The medium calibre artillery was reduced to 12×150 mm guns. A slightly bigger Nagato with half an inch more calibre, more side- but less deck armor. The AA is still weak (this must sound like a broken record). Otherwise a solid T7. Although you probably need to get closer to your enemies even more because at T7 your deck armor gets outclassed by other battleships while your belt still is your strong point. And you have reduced secondaries compared to previous ships and to the Nagato. You can expect the German WWI battleships to be slow tanks with weaker guns up to tier 6. From there you get a good upgrade in firepower but your accuracy starts to suffer. You generally prefer short range engagements due to your strong belt armor and sufficient maneuverability to dodge torpedos (unless at point blank range). Your secondary batteries are quite strong up to the L20 alpha. Either WG invent some fictional AA upgrades or you will need air defence from allied ships. Theoretically you can balance the German BBs around this, making them quite strong against ships but keep them vulnerable against planes. 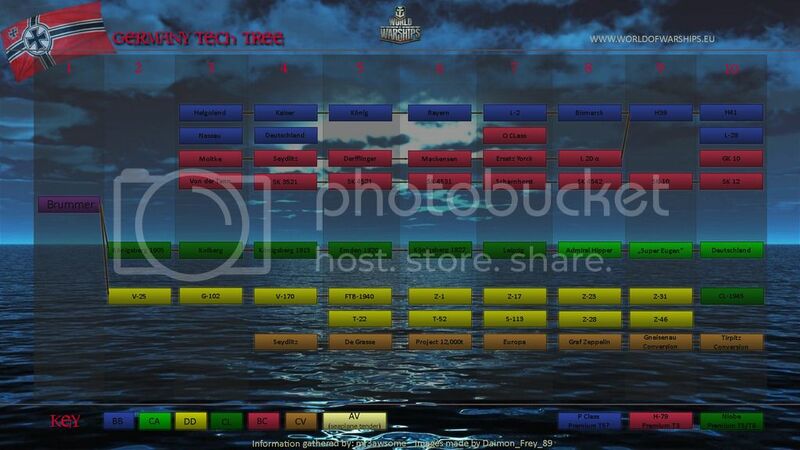 One question as for the destroyer tree – what about the tier 2-4’s ? Will this see the German torpedo boats, such as Möwe class or T 22 class? http://i1073.photobucket.com/albums/w395/mr3awsome/WoWS%20TT%20Public/wows_germany_horizontal_zpseqotclju.jpg this is a old, simple tree. It has low tier DDs. I do not know, for now – the series will continue, nontheless.